Hello! Well... the rush for me to make and send out Christmas cards is on, but thankfully I have two more made! Both of these were made with the fun November Spellbinders small die kit. I think the name is a bit of a misnomer because the kit comes with 14 dies... that isn't a small number to me, lol! 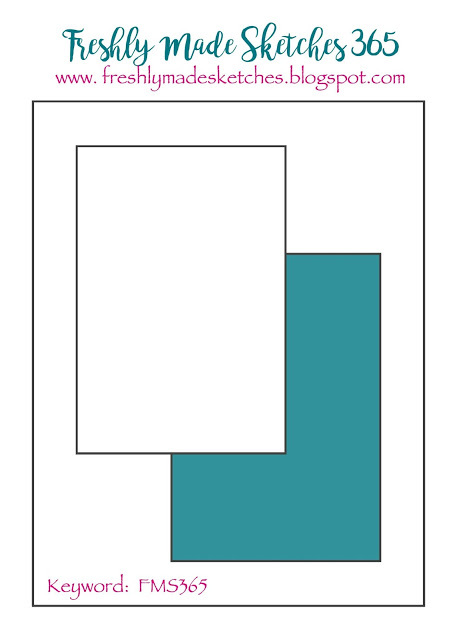 Anyway the first card is very, very simple. I used the layout from Freshly Made Sketches to help me along. 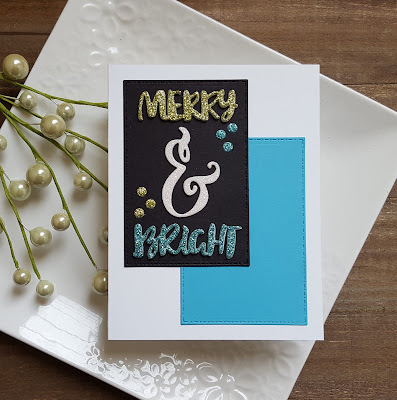 I used glitter cardstocks in bright green, bright blue and sparkly white for all the top die cuts and then made additional cuts using plain white cardstock. All the cuts were stacked together and then adhered to the black cardstock panel along with the little dots (another one of the dies). Another panel of cardstock in a color similar to the bright blue was layered behind the black panel and I was finished with the card. This card will also be heading over to the Simon Says Stamp Wednesday challenge of anything goes. 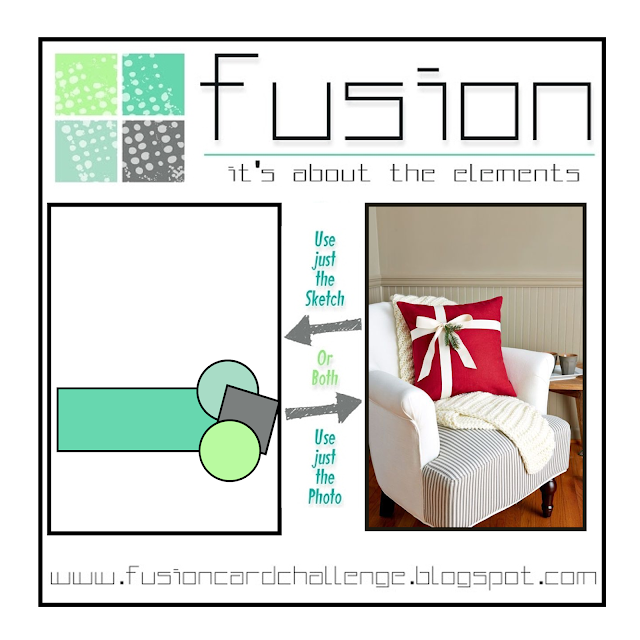 The second card will be heading over to the Fusion challenge as most of the colors found in the inspiration photo are also used on my card. I used more dies from the November Spellbinders small die kit to make this one, as well. 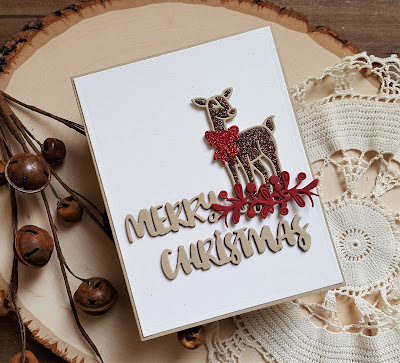 When I originally started working on this card I die cut the words Merry and Christmas from the kraft cardstock because I just wanted to have the words to move around and place where I liked them. But then I decided to actually go with that color as part of my design. I die cut that sweet little deer from the same kraft cardstock and brown glitter cardstock and then pieced the glitter cardstock inside the kraft outline. The bow was die cut from red glitter cardstock and adhered to the deer. I die cut the berry branches from dark red cardstock and adhered them together. I die cut additional words from the same dark red cardstock that was used for the berry branches and then stacked them together with the kraft words. I love how you can just see the red peeking out from underneath! Then everything was arranged on an off white cardstock panel. I finished by adhering the berry branches to the deer. I really like the rustic look of this design. Will be sending this one over to the Visions of Sugar Plum Christmas/Winter challenge. Oh wow--you are such an amazing designer, Rosemary! 2 fabulous cards--love the glitter & adore the deer! Great set of cards! I love the sparkly letters and bright colours! So fun for Christmas! Thanks for joining us this week at Freshly Made Sketches! All of the sparkle on both of your delightful cards is so festive! Love both of your cards! The first is such an awesome color combination and I love that brown glitter deer. So glad you linked up for my Visions of Sugarplums challenge! Two beautiful cards! Love these! So classy! Oh I love this! 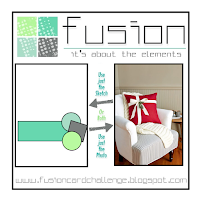 The turquoise and black combo are a really striking colours for Christmas. Thanks for joining us at FMS this week! Two fabulous Christmas cards, Rosemary! Your sparkly sentiment really pops on your first card and I love that you chose Kraft for your greeting on the 2nd card! Such a charming deer and lovely foliage, too! Thanks so much for playing along with us at Fusion! These are two gorgeous cards! That die kit looks amazing and you've used the dies to make super cute Christmas cards. Thanks so much for joining us at Fusion.